If you’ve found that your skin is starting to break out, then you’re going to be on the hunt for a product that can help you stay looking fresh and clean. There are so many different kinds of products that you can get for treating your acne that are aimed at different kinds of people and skin types. But you’ll want to look for the best face wash for acne that will work for you. If you’re not in the business of making your routine longer, then these products will be just for you. Each product has its own way of treating your skin and acne while fitting into your routine as a daily cleanser. Some of these face washes will also function as a scrub. They’re still gentle enough to be used daily (if not more often). But picking out one that will fit your specific needs and wants is going to be a little bit more challenging than just picking up the first one you see. We at Beauty Shortcutips will go through five excellent products that are available and teach you about the ingredients and ways that they will treat your acne. This face wash is meant to clear up your face quickly and help keep your face looking good even after you’re done with it. This gentle product uses exfoliation to help make sure that your skin is able to absorb the most of your acne medication. It’ll make sure that your pores are unclogged and that your skin feels better than ever. Even though this product still uses salicylic acid as a main ingredient, it features many natural ingredients that will work to unclog your pores and improve how your skin looks. This very natural solution can be used daily to keep your skin looking fantastic. Instead of layering on more products that will fight your skin, this product uses natural ingredients to work with your skin. This face wash is made for your morning routine. The icy feel of the product won’t just leave your skin feeling good, but it will wake you up to make sure that you’re ready to tackle the day ahead of you. ** Below, you'll find more detailed reviews, but you can also click on the links to see current prices and read customer's reviews on Amazon.com. 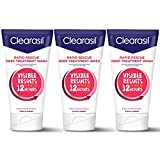 Clearasil has a lot of products that are meant to keep your face nice and clean. This one is particularly good because of the fact that it’s a face wash that continues to work on your skin even after you’ve used the product. This product like many of the ones on this list uses salicylic acid (a 2% dosage) to treat your acne. The salicylic acid penetrates deep into the pores to make sure that everything is clean. Your skin will be able to heal quickly with this wash.
Of course, the 12-hour promise of clearer skin is a hard one to live up to. While many users of this product find that their skin is clearer in 12 hours, there are many other users that didn’t see that much of a difference with this product, even if it was improving how their skin felt. With any acne fighting product, it is about finding one that works well with your skin. If this product doesn’t work well with your skin or causes you to break out more, then that is just an indication that you need to think about trying one of the other products on this list. This particular product comes in a pack of three, but the price isn’t bad for a pack of three. Neutrogena has always been trying to create great products to help your skin be clear and beautiful. This product is no exception. This particular wash is oil-free. Not only is this good news if you have oily skin, but it also is good for fighting off acne. If there were extra oils in the wash, then it would just cause more problems for your skin. The interesting part of this product is that it is also a daily scrub. While many dermatologists would say that a scrub isn’t something you need to do every day, this scrub is gentler than others to just help unclog pores and remove any dead skin and dirt to make sure that there’s nothing in the way of your skin improving. 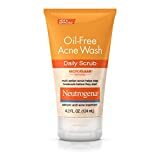 Neutrogena is also using their MicroClear technology in this product to help deliver acne medicine deeper into the skin. For anyone that has specific acne medication that they apply, this wash will be able to make sure that you’re getting the most out of your product. 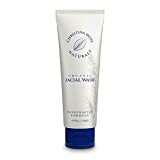 This wash may dry out certain skin types, so be careful when you’re testing out this face wash. You don’t want to overly dry out your skin. For a 4 ounce bottle, This is an extremely reasonable price. So far on this list, all of the products have been using salicylic acid and other chemicals to make sure that your skin is clear. However, this product is slightly different. Instead of just using salicylic acid, this product uses a whole arsenal of natural ingredients to help unclog pores and exfoliate your skin. This means that you’re only using some chemicals on your skin to help treat your acne at its source. This product can cause some skin irritation for some people. This becomes doubly true if you’re using another acne medication at the same. The product recommends that you only use one at a time. For those that want a wash that will complement the rest of their routine, this might not be the right product. For those that aren’t using another acne medication and need a wash that will fight their acne, then this will be a great product. The product has instructions on how to use, even taking into account the fact that this product may dry out certain skin types more than others. You may have to experiment with this product to figure out just how much you can use this product. However, for a 6-ounce tube of this scrub, It is an extremely affordable product. This wash is for those that want something without chemicals that will help their skin restore itself. This is the one item on this list that doesn’t include something like salicylic acid to help your skin get rid of and prevent future outbreaks. This product is wonderful for those that are worried about all the extra chemicals that are in some face washes. Everything that is in a wash is absorbed into the skin at least a little bit, so this wash focuses on getting rid of as many harmful chemicals as possible to make sure that your skin is still feeling fresh when you use this wash.
Because this product is gentler than others, there are some people that might not see improvement in a time frame that they want. But if you’re trying this product, you need to keep in mind that you’re not only fighting off acne but improving your skin’s overall health. It will take time. A 4-ounce bottle can last as long as many other 8-ounce bottles. This wash is made to help improve your skin and wake you up. If you are considering this wash, then you may want to keep it as a morning wash instead of a night time cleanser. Of course, not everyone feels the full effects of the icy part of the product. This cleanser doesn’t do just a good job of getting rid of acne, but it also can be used to really remove every trace of makeup that is on your face. If you already use a makeup remover but worry that it’s not getting absolutely everything off your face, then this facewash will really be for you. Like with trying a new face wash, you have to be careful when testing it out. Early on you may find it to be drying while you are trying to fit it into your routine. But with a 6.77-ounce bottle you’ll find that it is a reasonable addition to your routine. Even though we like these five products, you may find that they don’t work for you. That doesn’t mean that our list is terrible, but that you need to worry about your skin type first. There’s a lot to consider when you’re trying to find a face wash. When you’re looking at the products on our list, you’ll notice that all of them (with 1 exception) have salicylic acid. This acid works to break down skin and dirt and clear out your pores. Because it is a stronger acid, it will get deep into your pores and help remove the sebum and build up within them. The key to fighting acne is helping reduce the gunk that is stuck inside of the pores. This is possible with natural ingredients as well, but salicylic acid is one of the best ways of fighting acne and it is often recommended by dermatologists of all kinds. The most important thing to consider when you’re looking at a face wash is the kind of skin types that you have. If you have drier skin, then you’ll want to be extra careful to look for a wash that is alcohol-free or that might have moisturizing elements within the wash. If you have oilier skin, then looking for a wash that can really remove excess oils is going to be important. Not every wash will work with every skin type, but drier skin will have the hardest time with finding a good cleanser to fight acne. In order to get rid of acne, the skin needs to get dried out a little bit, so finding a wash that balances drying out your acne with making sure your skin is still moisturized is incredibly important. 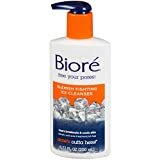 When it comes down to it, I would probably choose the Biore Blemish Fighting Ice Cleanser. This product is the gentlest of all the products that we reviewed, which means that I won’t have to worry too much about my skin drying out. Of course, it will still take some work to get my skin used to the new wash, but that’s just part of the deal. When you’re considering your new face wash, remember that any product, even one that we consider to be the best face wash for acne, has the possibility of not agreeing with your skin. If you react to a face wash, then stop using it and maybe try a different one. Be careful with your face washes and treat your skin to a moisturizer after you wash it. Top 5 Best Charcoal Peel Off Masks: Tired Of Blackheads? Try These Masks!